As always, feel free to leave any questions you might have in the comments, and we’ll maybe take a look at them in the next Q&A session. This is a great question and one I get asked a lot! The thing is, there are many, many options for books – so many that it can be really overwhelming! I want to share with you some videos I’ve done on this topic in the past, and then we’ll talk about a few other tips. “The best piano books for beginners” is one of the earliest videos of this channel, but my recommendations would more or less be the same. I discuss around 10 of my favorite books for this level, and talk about why. The idea is that you could pick 2 or 3 from this list (you certainly don’t need 10!). “The best piano books for grade 1” is the same idea, only these books will be a little more challenging. Once you’ve spent 6 months or so with the beginner-level books, you’d probably be ready to check out some of these. 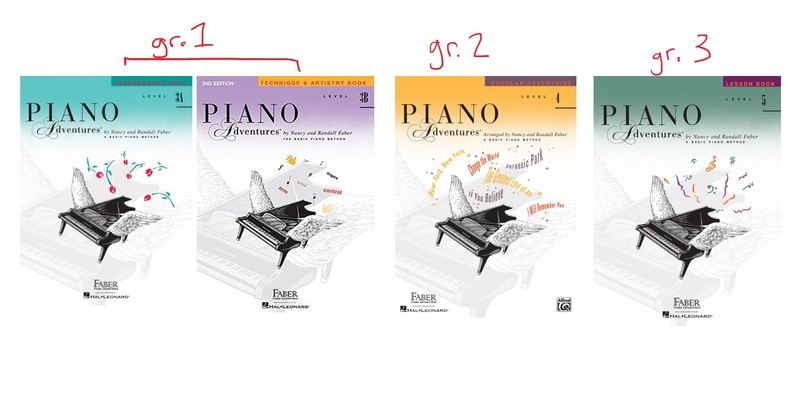 “The best piano books for grade 2” is the same idea again. When you’ve worked on grade 1 level pieces for six months to a year, this is a good batch of books to flip through. Again, you really only need to pick 2 or 3 from the list – enough to cover various genres (baroque/classical, romantic/modern, etc.). “The best piano books for grade 3” is the most recent of the series, and follows the same format as the others. I think those lists should give you a good start, and of course I’ll make more as we progress on this channel. A lot of the time, people will simply get the RCM books, and this is a really foolproof way of progressing (especially if you don’t have a teacher). But I find specific books much more interesting – I’d rather have, say, an iconic Schumann book than one Schumann piece in a big collection. But I’m also a teacher, and I love to collect music books – and there’s no right or wrong way to do things! For those not familiar with the Piano Adventures series, this is what they look like. It’s a great series and one I use in my studio with basically every beginner. The fourth and fifth books are actually pretty high-level! This is how I equate them with RCM/ABRSM grades. So once you’re done the method books and you’re ready to branch out, my first suggestion would be to check out the grade 2 or 3 book list I linked to above, in the first question. Another approach, if you want to explore even more options, is to check out the RCM syllabus. They have a giant list of pieces in all different musical eras, and what book they’re found in. I’m a nerd, so I have quite a bit of fun exploring these books and listening to some of the pieces on YouTube to see what sounds fun. This syllabus is my holy grail, just because it’s so comprehensive! This is a question that we could explore for hours, but I’ll keep it brief. By “runs” on the piano, I assume you mean things like scales, arpeggios, cadenzas and the like. There are two things I usually do when I’m practicing to accomplish this. First of all, I’ll play the run with the metronome, at a speed that feels doable and comfortable. It’s usually a very slow speed when I’m starting – the speed I can play without making a single mistake pretty easily. I’ll usually write down the speed somewhere in my music so I don’t forget. Maybe I spend 5 or 10 minutes on it in one practice session. The next day, I’ll review the run at that (slow) speed to make sure it’s comfortable again. Then, I’ll bump up the metronome’s tempo by some tiny amount – usually 5bpm, but it depends on your piece. If you’re playing quarter notes at 130, a 5bpm increase is very doable. But if your original tempo is 55, then a 5bpm increase is pretty significant. Again, I’m only spending 5-10 minutes doing this. I keep going through this process for a couple weeks to a month, depending on how fast it needs to be. It results in slow-but-steady progress and a good end result. You might find yourself hitting a few walls along the way – perhaps you’re within 10bpm of your goal, but you can’t seem to speed it up without your playing becoming sloppy. These walls are inevitable, and it’s okay to simply maintain the same speed for a few days (or even slow down). It’s all about finding a balance between pushing yourself just a little out of your speed comfort zone, but not so far that your playing becomes sloppy. My other speed technique is to micro-manage the run. If the run is four bars long, I’ll work on one bar at a time (or maybe even less, depending on the run. I’ll spend 5-10 minutes working on only that bar, memorizing it, and getting it faster and faster until it’s up to speed. You should be able to get one bar of music up to speed in 5-10 minutes. If not, it’s either too tough for you, or you need to work in a smaller section. The next day, I’ll re-approach that bar – it’ll usually need a couple minutes of work to get it where it was the day before – but then I’ll do the same thing with the next bar of the run. And so on, until you’ve got the full run up to speed. It’s not an instant process – usually takes a couple weeks to iron out all the kinks – but it’s very effective. This is a difficult piece, at an RCM grade 10 level. I assume what you mean by “pure fingers” is following the editor’s finger patterns. That would be my first suggestion – always try the finger patterns suggested by a professional first! There are generally a few causes of pain when we play piano. The first is poor posture, which I’m going to assume you don’t have. You want to make sure your wrist is level with your forearm, not dipping or rising too high. You want to make sure you’re sitting adequately far away from the piano so you’re not squished. With that corrected, tension is a major cause of pain at the piano. It is very, very difficult to play fast passages without tension. The tendency is for the hand to seize up and turn into a claw. The idea is to keep the hand as relaxed as possible, which is much easier said than done. Tension and hand fatigue is often the product of playing a certain passage too long. It’s like if you were to try to do chin-ups, having never done them before. The first one might be okay, but as you do more reps, your muscles start getting tight and it feels like you have to fight through gravity. It’s possible that your piano “muscles” aren’t buff enough for this passage. You might find that your fingers seize up and start getting tense after just a minute of fast practice. But you can slowly build up endurance. When I’m working on very fast and awkward passages (such as the 6ths in this nocturne), and I find my hand growing tense after 30 seconds or a minute, I quit practicing fast. I keep working on the same passage, but slowly, and keeping my hand very deliberately relaxed. Then, once I feel like I’ve recovered, I play the fast part again for another 30 seconds to a minute. If you give yourself tons of rest in this way, you should experience much less pain. And maybe next week or next month, you’ll find that your endurance is a minute and a half. You need to give your hands plenty of time to adapt to strange micro-movements. I hope you enjoyed today’s Q&A session! I love doing these videos because we’re able to get super-specific and cover a wide range of topics all at once.